Columbus 125’ Hybrid motor yacht – Superyachts News, Luxury Yachts, Charter & Yachts for Sale. The Columbus 125’ Hybrid motor yacht was designed by Sergio Cutolo, of Hydro Tec Naval Architecture, and is expected to be a real innovation concept in the yachting field. The construction of the Yacht Columbus 125’ Hybrid is planned to start in the Neapolitan Shipyard soon. 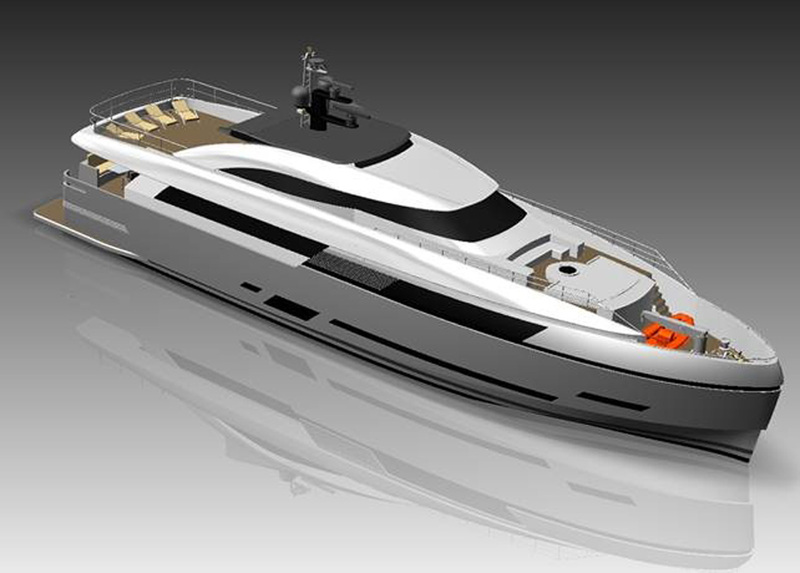 A Russian Buyer has made a firm order to Palumbo Shipyard for the construction and delivery of a Columbus 125’ Hybrid motor yacht by August 2013. The Russian client represented by broker Jimmy Broddesson of Bluewater Yachting also has the option to buy the second hull of the same series. Born to incorporate the love and passion for the sea together with the respect of marine environment, the Columbus 125’ Hybrid Yacht was designed to reduce fuel consumption and environmental impact. Columbus125’ Hybrid superyacht will measure 37.86 meters in length with a beam of 8.20 meters, stretching over three decks with very impressive internal volumes. The Columbus125’ Hybrid will be able to accommodate up to 8 guests + 1 in three guest cabins plus the Owner suite. The crew will be accommodated in 3 crew cabins plus one captain cabin. A spectacular flybridge with an extraordinary autonomy and modern exterior styling are the main characteristic of this new fabulous yacht. Both the classic full displacement hull and the superstructure are built in aluminum which enables the yacht to reduce weight and fuel consumption. The Columbus125’ Hybrid motor yacht has an optional diesel electric hybrid propulsion system, constructed with the intention of having a minimal impact on the environment with a large cruising range of 5,000 nm.